Ecola State Park: an absolute must! I would have to say that this was my favourite place on the whole Oregon Coast. The drive into the park is outstanding- a winding road that is purely magical with moss covered trees and gigantic mansions- WOW! It is a spectacular drive and then every now and then you get a glimpse of the coast line in all its savage beauty! Once into the park it is a $5 fee- the best $5 you will ever spend in your lifetime! The views from the trail just off the parking lot of the coastline are some of the most picturesque we saw on our whole trip. The view of Haystack is amazing and you can also see the lighthouse “Terrible Tilly”. Walk the path off the parking lot and you will get some of the best pictures of the coast including Crescent Beach, Cannon Beach and Haystack. 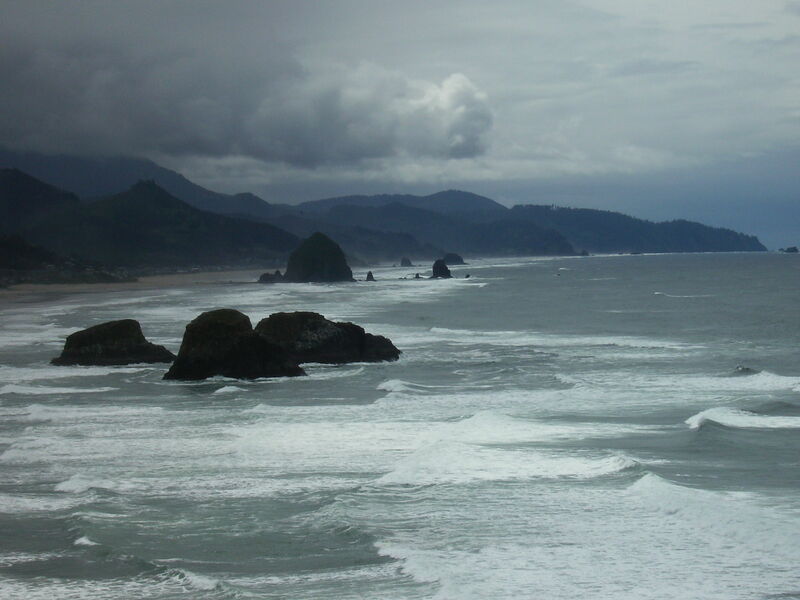 In fact, I like my pictures of Haystack better from Ecola than from Tolovana State Park. Head down to the beach and hike the rocks- we spent hours here! We saw loads of starfish and just had a great time climbing the rocks and trying to outrun the incoming waves. Once you tire from the beach there is a terrific trail that leads you to Indian Beach, you can also drive to Indian Beach if you choose. We did half the trail and decided to drive as the trail was very muddy and we were already exhausted from spending so much time on the beach. Again Indian Beach afforded us great views and hours of fun on rocks and in water! It really is a spectacular area and by the time we left it was well into the afternoon and we absolutely exhausted from mucking about!! This entry was posted in The Oregon Coast. Bookmark the permalink. 2 Responses to Ecola State Park: an absolute must! Hey Shelley…just reading about the haystacks you saw @ Ecola Park in Oregon…as you can see by my profile pic, I was there too and was really quite impressed and amazed as well. Just gorgeous! Thanks for sharing your road trip adventures! Great to hear from you! Thanks for checking out the site. It is a lot of fun writing about our travels and brings back such great memories!! Hope all is well with you! have you been on any fantastic vacations lately?